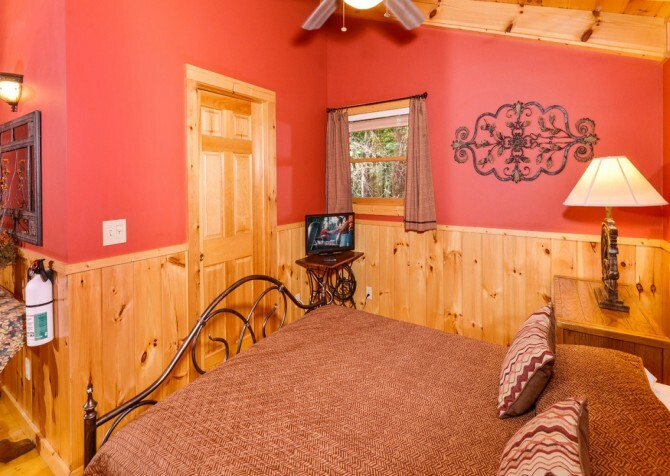 Conveniently located between Pigeon Forge and Gatlinburg, Turning Leaf is a two bedroom, two bathroom Gatlinburg cabin with room to sleep up to six guests. Great for fun family vacations and getaways with friends, Turning Leaf features easy access to local transportation, beautiful and inviting interiors, the comforts of home, and lots of amenities. Just a short drive up the mountain, Turning Leaf is easily accessible, even in winter. 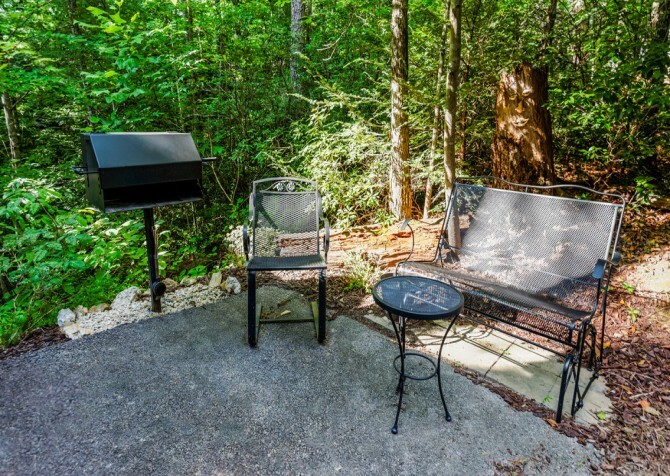 With a location near the downtowns of Pigeon Forge and Gatlinburg, it offers easy access to the Gatlinburg Trolley and Pigeon Forge Fun Time Trolley systems. Both towns can be easily reached from The Spur. 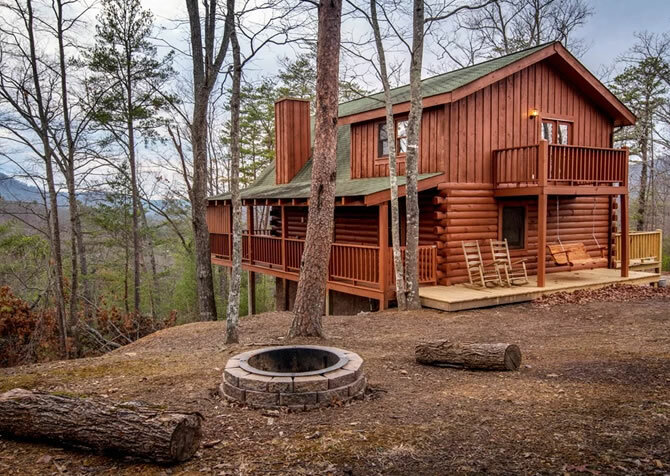 For those looking for some fun on their vacation, this great Smoky Mountain cabin is near tons of family-friendly attractions and activities. 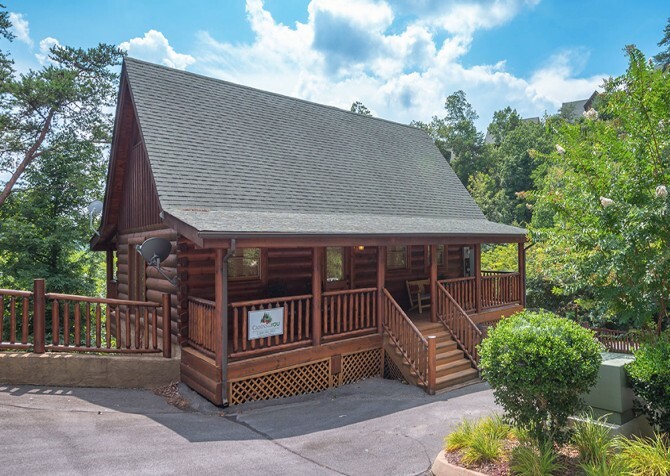 Within a short drive you'll find Dollywood, Cades Cove, whitewater rafting, miniature golf, laser tag, go karts, several museums, Ober Gatlinburg, and the Great Smoky Mountains National Park! 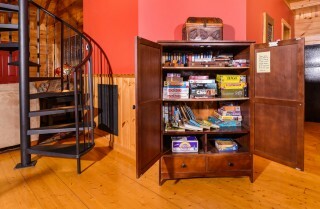 After a day of exploring, Turning Leaf provides a relaxing and comfortable place to unwind. 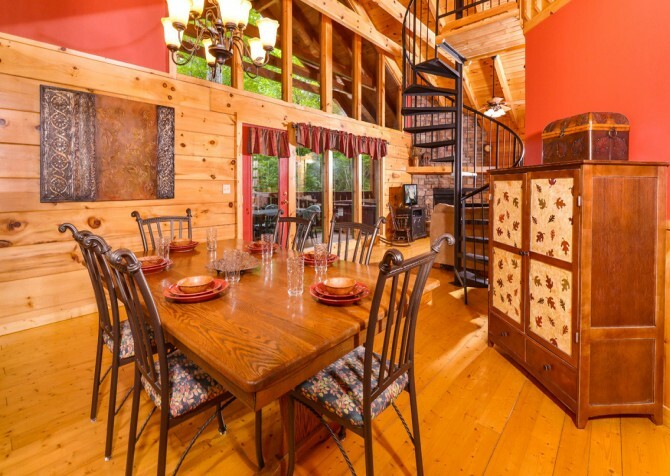 As you step inside the front door, you'll be greeted by the great room with high ceilings and large windows that look out into the lush woods of the Smokies. 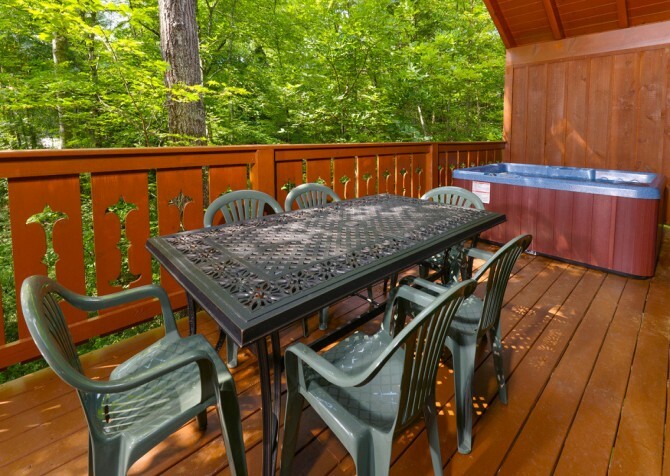 The semi-private, wooded setting offers a peaceful atmosphere. Throughout the cabin, a whimsical leaf motif and warm colors create a warm and welcoming stay. 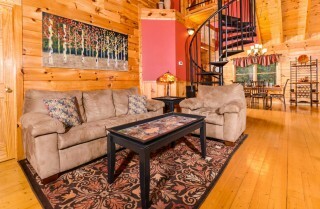 In the great room, a plush sofa, matching chair, and a rocking chair surround the flat screen TV and gas fireplace. 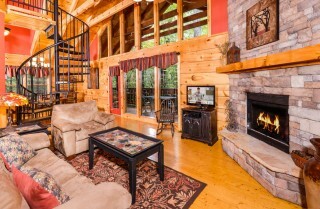 It's a perfectly cozy place to curl up, stay warm, and enjoy your favorite shows. If you love movies, check out Netflix or bring along your favorite flicks to play on the Blu-ray player. 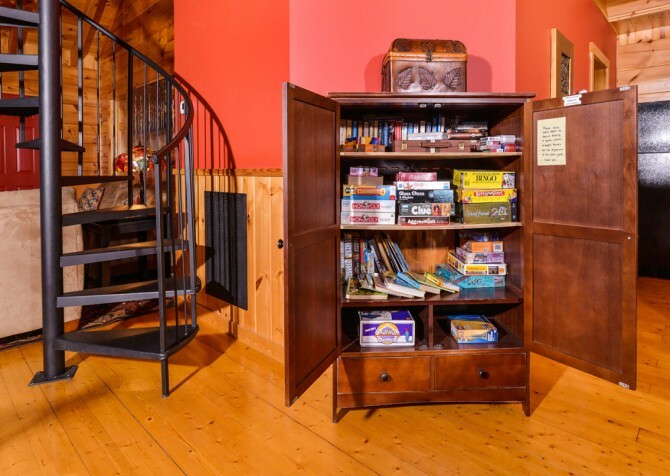 On family game night, open up the game cabinet for puzzles and board games to play on the coffee table. You'll spend hours of quality time relaxing and playing in this space that will feel just like home. Keep cool on hot summer days or stay warm on those chilly Smoky Mountain nights. Once you work up an appetite from all those games, head to the fully-equipped kitchen for meals and snacks. 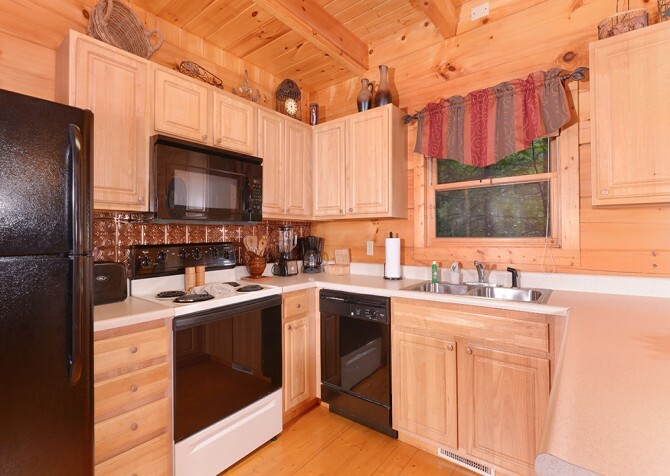 The kitchen provides all the essentials, plus a dining bar and a dining area with room to seat up to six guests. 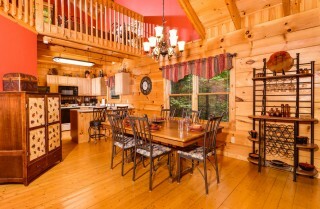 If you'd rather go out to eat, there are dozens of great Gatlinburg restaurants just a short drive from Turning Leaf. Both Pigeon Forge and Gatlinburg have everything from burgers and wings to steak and seafood. And of course, there are lots of great places for desserts, including ice cream, frozen yogurt, candy, cupcakes, and more. Just off the kitchen is a laundry area that offers a washer and dryer and an iron and ironing board. They're great conveniences if you prefer to pack light and want to keep your clothes looking fresh. 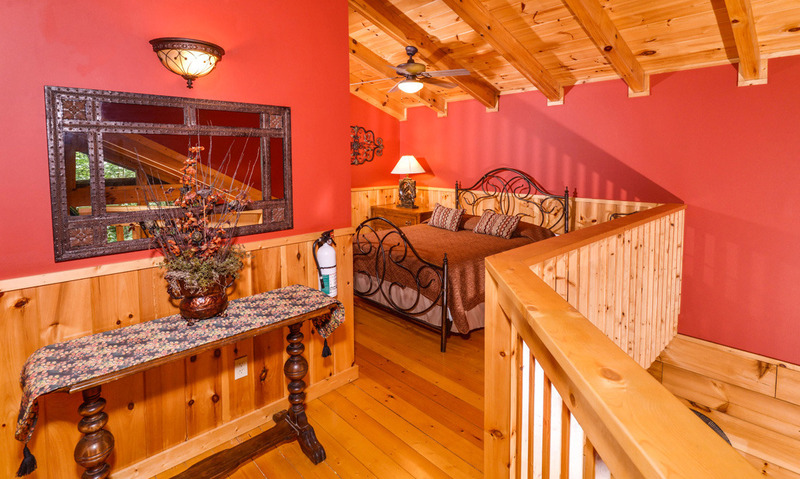 Simply toss in a quick load of laundry after a day of hiking before heading out on the town. 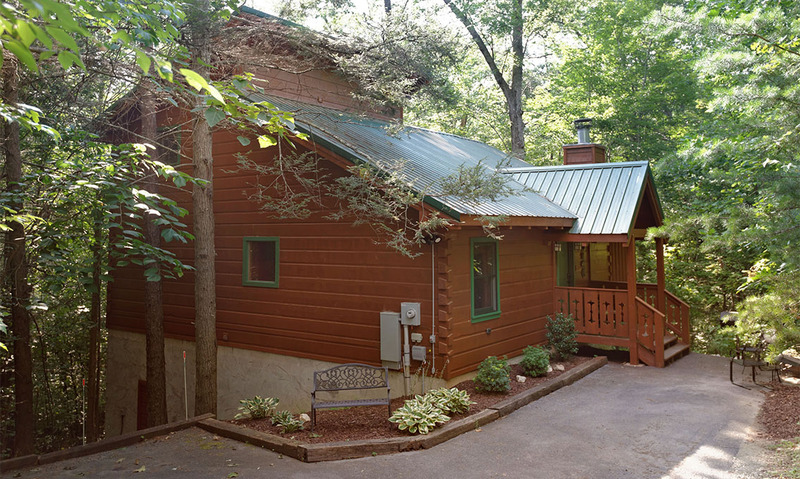 At night, the two bedrooms in this Gatlinburg cabin will offer peaceful places to rest. 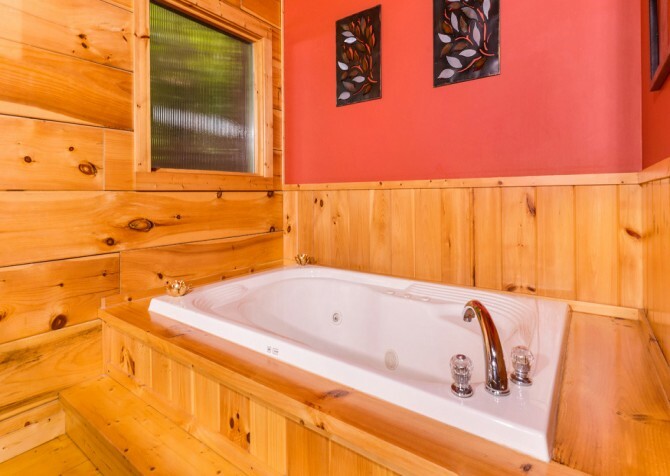 The master suite is a true escape with a jetted whirlpool tub, shower, comfortable king size bed, and plenty of room to store clothes. The second bedroom, located on the loft level, features a queen size bed, a flat screen TV, and an attached bathroom with a shower. 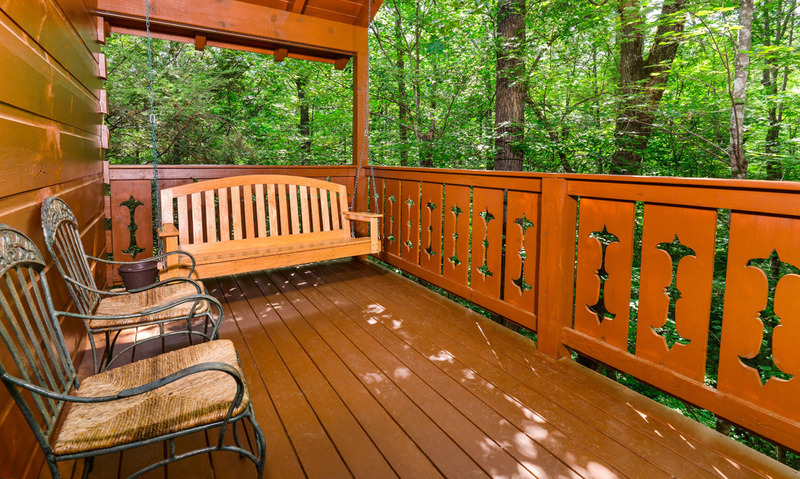 One of the most popular reasons to visit the Smokies is the great outdoors, and Turning Leaf offers great spaces to enjoy the scenery. On the deck, take in the sights, sounds, and smells of the Great Smoky Mountains as you dine outside or fire up the grill. As you sit on the porch swing, enjoy the peaceful wooded views and let your worries melt away. There is even a hot tub that's perfect for soothing sore muscles after a long day. 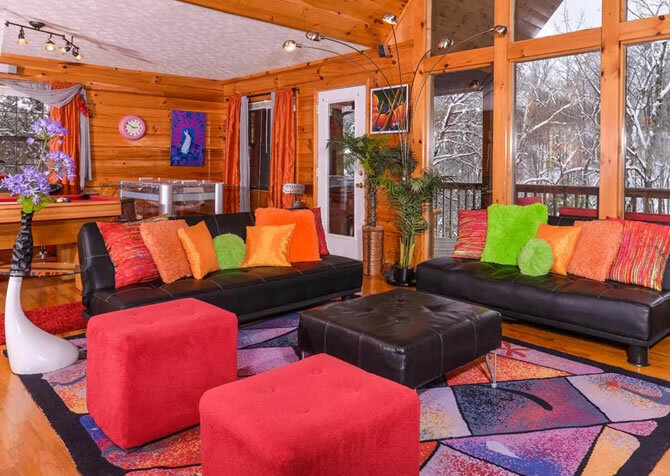 With great amenities, beautiful interiors, games, and a convenient location, Turning Leaf is a great Gatlinburg cabin for a fun-filled getaway with family and friends. For more information, call 1.800.684.7865! "We stayed at Turning Leaf in Gatlinburg for the weekend and loved it. Everything was perfect and looked just like the photos. 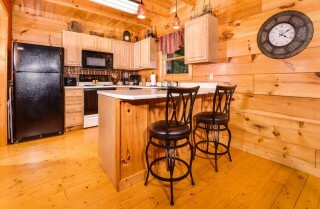 The cabin was so neat and cozy. When we needed assistance they called us back immediately. 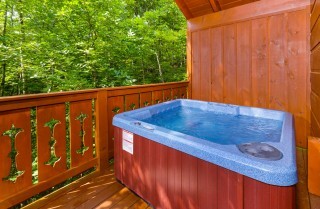 Thank you for a wonderful get away!" 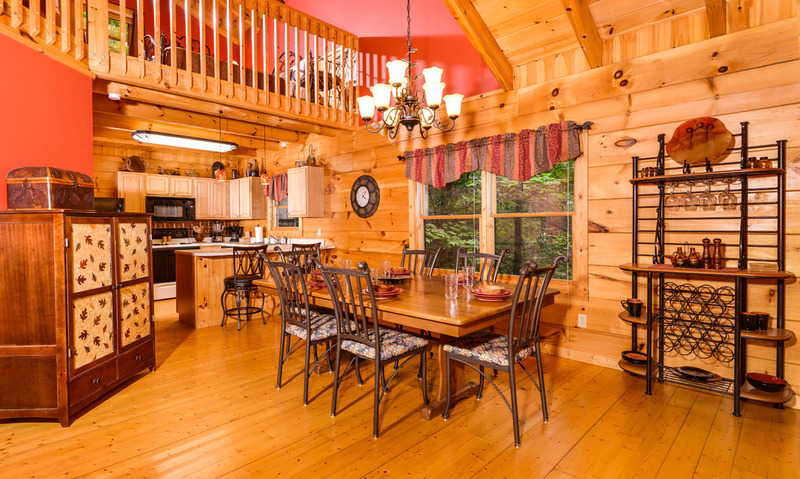 "This cabin is amazing. 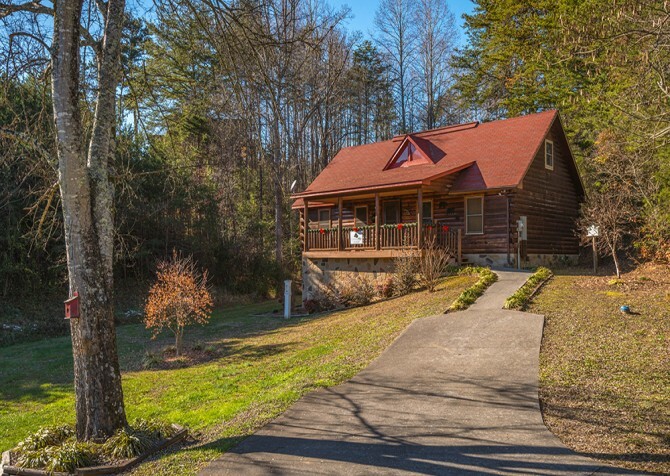 Great location in between Pigeon Forge and Gatlinburg. It is tucked into the hillside making it a great place to get away from all the hustle and bustle life brings. The driveway is a bit steep but has just enough room to turn a F150 around. 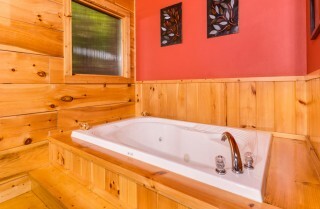 The hot tub, fireplace, indoor Jacuzzi and over the top comfortable king bed make it a great romantic getaway place. 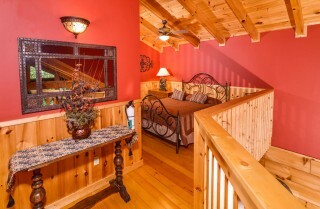 The queen bed in the loft is great if your significant other snores a bit."